The slim 17.3 incher addresses fans of good performance and good music. Asus achieves the unexpected in terms of acoustics. A subwoofer and stereo speakers take off like a small hi-fi system in terms of music and games. Mobility fans will also be attracted by the energy saving Optimus technology. Find out if the bundle, made up of a GeForce GT 325M and an Intel Core i5-430, has other convincing arguments in our comprehensive review. 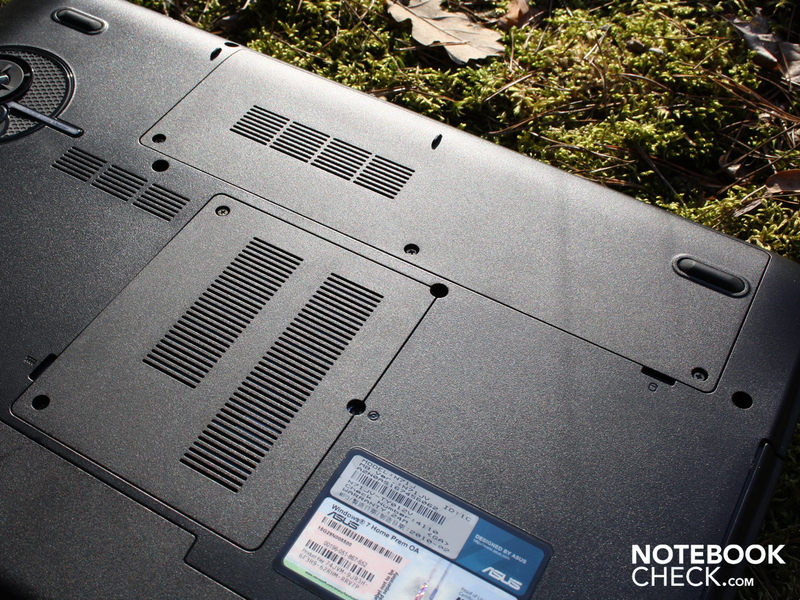 The Asus N71JV is aimed at laptop buyers who want to put a strong 17.3 incher on the desk instead of a desktop PC. Naturally, the newest technology, such as a Core i5, Nvidia Optimus and USB 3.0, should be used. Both man and woman alike want to be equipped for the next years to come. This imaginary user focuses on entertainment. Shoving bulks of movies and music back and forth, always online and listening to music directly over the built-in 2.1 loudspeakers. Oh, right - a bit of gaming is also desired and so the graphic card has to be reasonably fast. 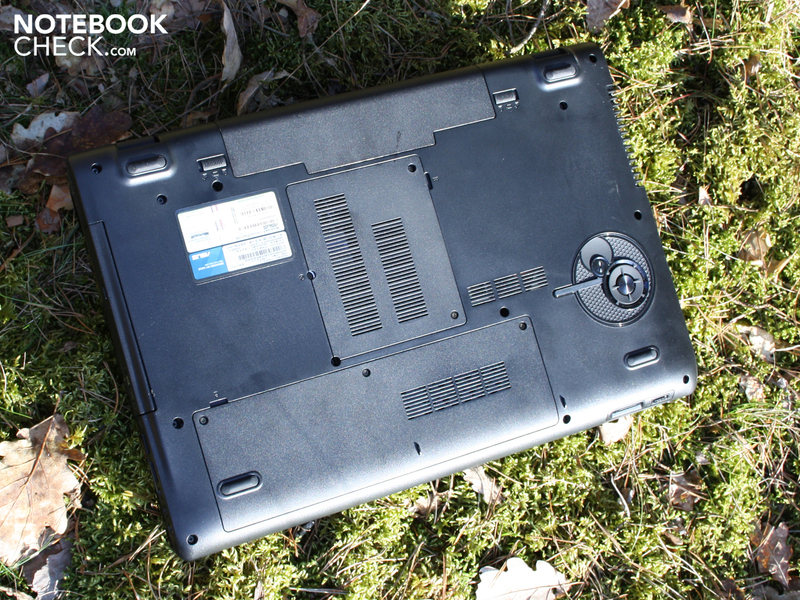 We've checked what this multimedia notebook, N71JV, is capable of. The manufacturer cites Splendid "Super-Sonic" multimedia enjoyment. Empty words or fact? 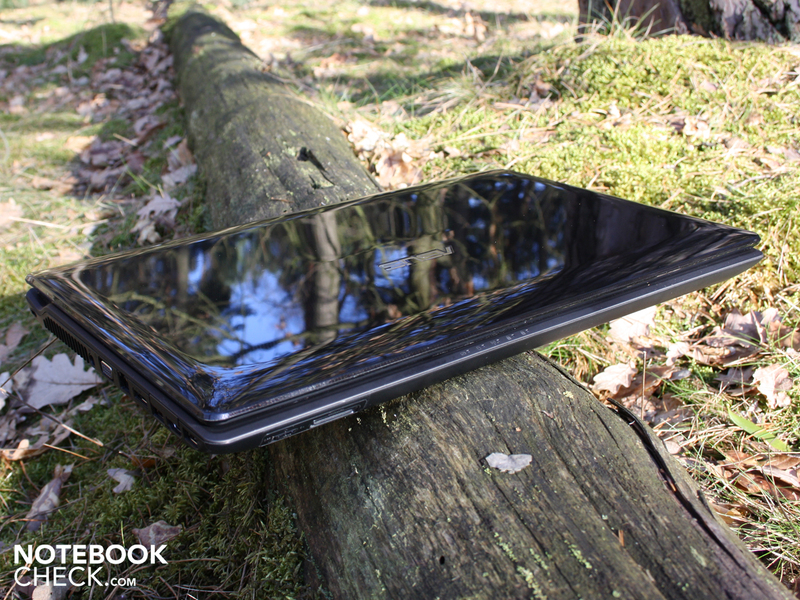 You'll find the comprehensive specifications about the 17.3 incher on this page. 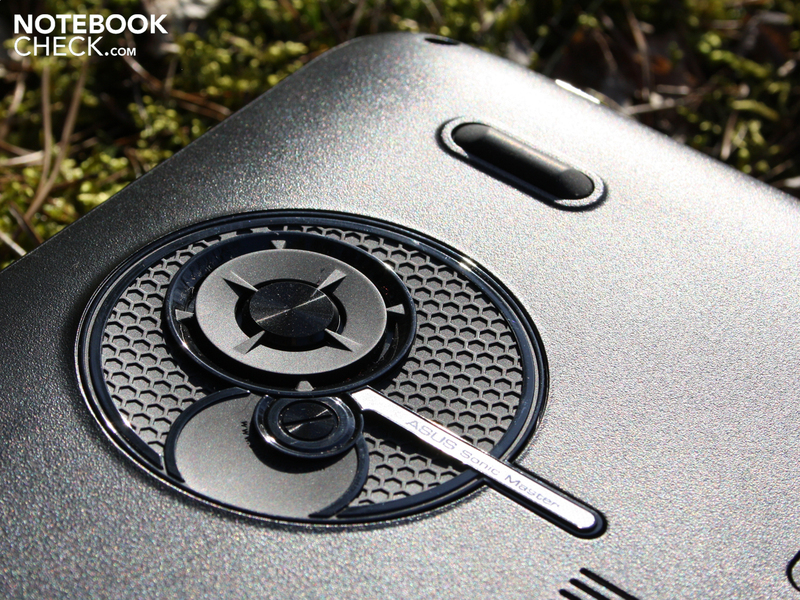 The N71JV's case is both suitable for the office, as well as for the movie night and gaming session alike. Office workers get a pleasantly rubbery surface on the work surface. It is, of course, matt and has a good grip. Users aren't protected against fingerprints though, as we soon had to find out. Greasy fingers leave dark spots that can't simply be polished away. The battery can be removed for permanent work on a desk. It doesn't leave a gap in the looks. Basically, the combination of matt surfaces and the colors, black and silver, give the 17.3 incher a mature look. 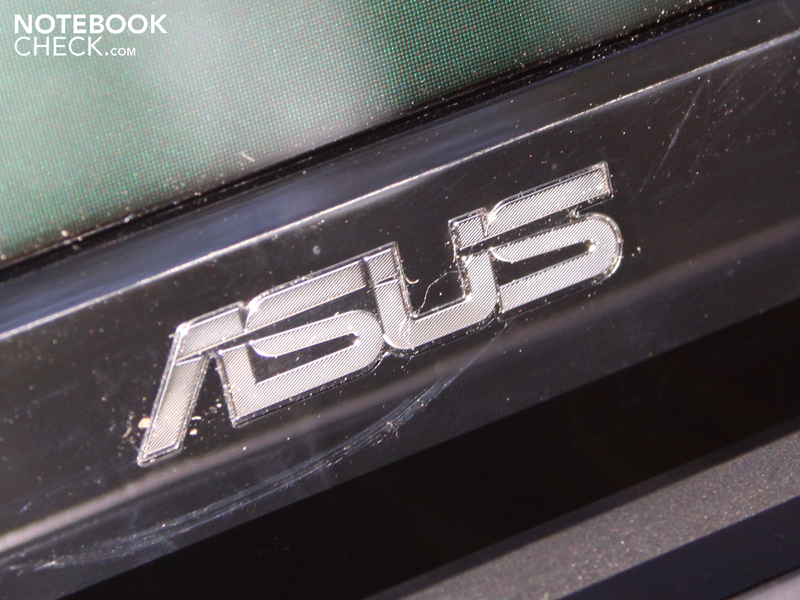 But Asus hasn't forgone on glossy surfaces. The black-brownish shiny lid collects fingerprints and is on par with the black display bezel. The reflective display fits perfectly into this combination. Even if not always in the users interest. We can establish a severe impact of dust and fingerprints to the looks in outdoor pictures in the sun. The display bezel and the reflective surfaces collect every kind of dirt and exhibit it, too. The same applies for the plastic enclosing, in which the keys are separated from each other. These key gaps also wear dust very visibly. The case isn't quite as stable as we would have thought. We can easily twist the chassis with both hands, but only slightly. The wrist-rest fits tight. This, unfortunately, doesn't apply to the key field. It coils obviously in its center. We can twist the lid evidently without excessive effort. Its surface is also a bit instable, but which is normal in view of the 17 inch size. The hinges are well-constructed and sit firmly in their place. They have been pulled very tight and we always need both hands for opening the lid. The maximum opening lacks a definite stop and the lid teeters. The maximum opening angle is more than sufficient for a use on the lap, even for bigger people. The base plate is made of simple plastic and can only be dent slightly in the area of the big louvers. 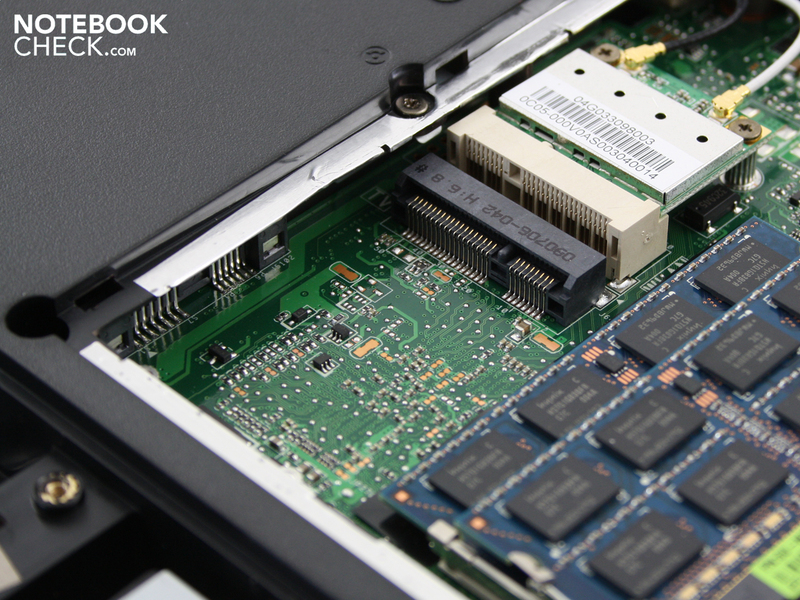 Both covers allow for exchanging the hard disk, RAM or WLAN module. This theoretically also applies to the Core i5 processor. 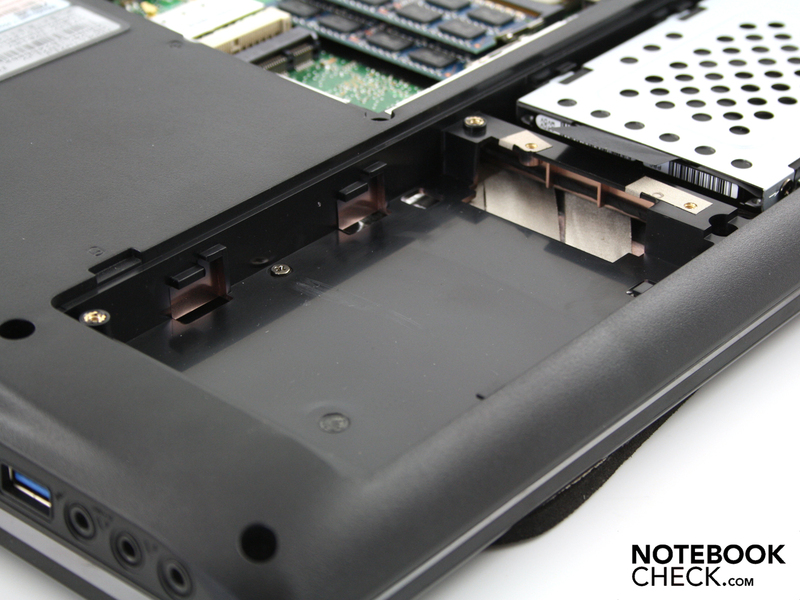 It's inserted and easily accessible after removing the heatpipe. However, the entire base plate has to be removed beforehand. The hard disk slot is closer. But, what's this? The dream of retrofitting with a second HDD bursts due to a non-existent SATA slot. Upgraders, therefore, have to be content with the free Mini PCI Express slot. It even has place for a complete construction length (full sized Mini PCI-E). 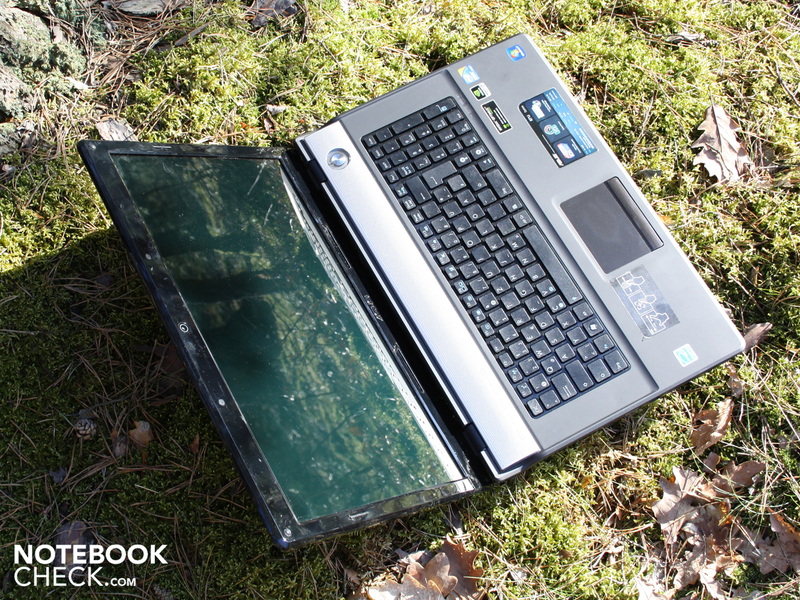 The entertainer has almost everything that a multimedia notebook can have these days. First to be mentioned is a USB 3.0 controller, which allows a tenfold faster data transfer, according to the manufacturer. This naturally requires an external hard disk that is very fast and which is also inserted in a USB 3.0 chassis. 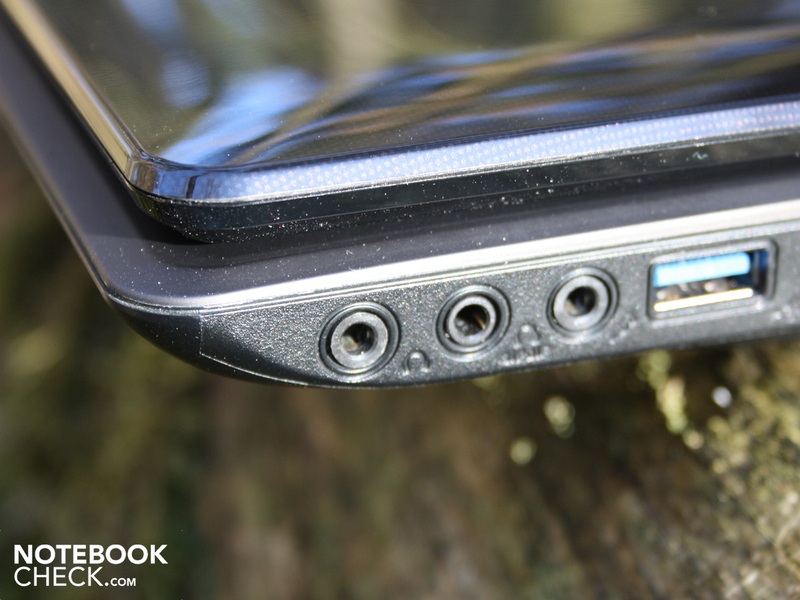 A blue USB 3.0 port is on the N71JV. The other three are common USB 2.0 ports. The 3.0 port is, of course, backwards compatible. If you don't care much for fast hard disks, you can at least charge your telephone or the like due to the higher amperage (900mA instead of 500 mAh). Even external 2.5 inch hard disks that needed a second USB port for operating should be sufficiently provided for with the blue USB port. The user can connect his monitor or flat screen to HDMI or via the analog VGA interface. The demanding multimedia fan can't connect his camcorder via FireWire, though. However, if you want or have to retrofit such a connection, you can use the ExpressCard 34 slot and buy the correlating iLINK controller card (20-40 euro). In our opinion, the port positioning (right & left) isn't rational. Thus, the ports placed in the front area (left: USB, HDMI, eSATA; right: 3 x audio, USB) are comfortable to use, but unwieldy cables take up a lot of place on the desk. Fans of tidiness won't be able to accommodate to the sight of a well cabled N71JV. At least, especially stiff and unwieldy cables, like eSATA, VGA or HDMI should have been placed at the rear. The deep-sitting hinges prevent a use of the rear for ports, though. All ports, including the DC-in, are accumulated on the visible sides. The Atheros AR9285 wireless card supports WLAN in the fastest draft-n standard. In order to use this bandwidth, a draft-n router naturally has to be at hand. An integrated Bluetooth module (2.1 + EDR) are included on top. If you want to connect the 17.3 incher with the gigabit switch at home, a fitting Ethernet card awaits you in form of the AR8131 PCI-E gigabit adapter. Anything else would be unsuitable for a multimedia laptop of this price class. As in almost all of its devices, Asus uses detached keys. They are fairly far apart and are optically connected by a crosspiece. The keys supply the typist with a pleasantly distinct pressure point and a long stroke length. The stroke is, especially due to the intensively coiling surface in the center, more or less indistinct, though. Already a light typing in the center provides for an obvious bending of the key field. The keys don't use the broad surface entirely. The keyboard is confined by a 2.5 centimeter wrist-rest. Thus, the 17.3 incher only has a key size and key surface that many 15.6 inchers bid, despite its enormous surface area. 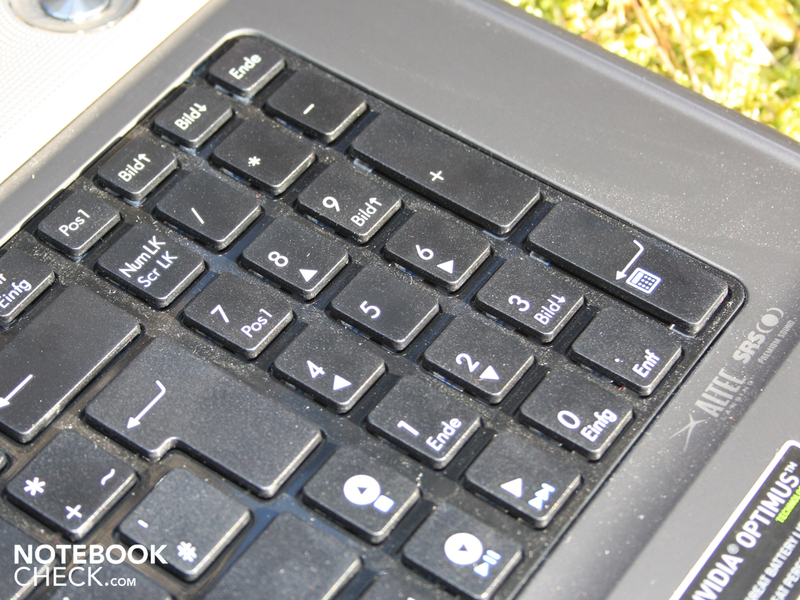 The tiny number pad's keys are made in a netbook size and the arrow keys are unnecessarily wedged in. In computer games, as well as Word or Excel, it often results in fingers hitting the "one" or the shift key. Those who type frequently should trial type on the keyboard in any case. The manufacturer insists on a cleaned-up work surface and only integrates hardware keys for the operating mode (Asus Power4Gear modes), which have a volume and a play/stop button. The latter also addresses the Windows Media Center. The mouse substitute is submerged slightly into the wrist-rest. Users notice the difference due to a small cavity in which the sensitive area is placed. 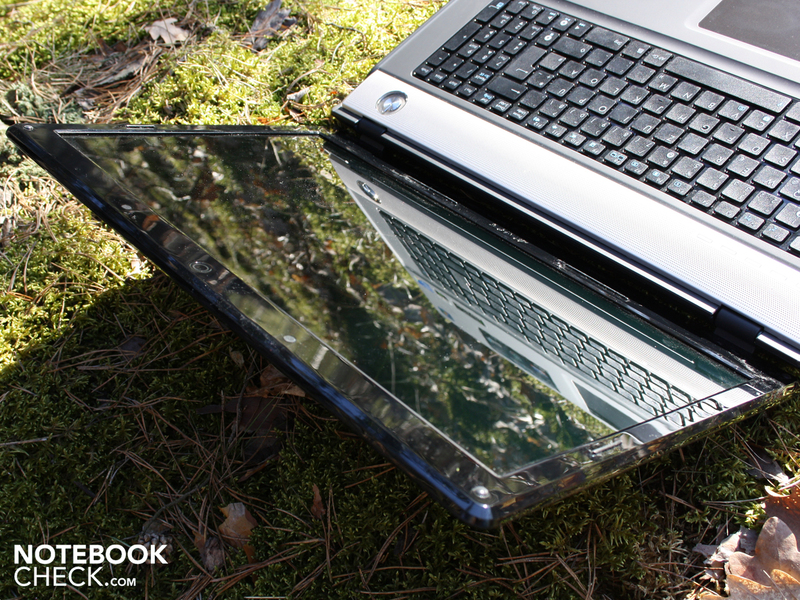 The surface is very big and touch-sensitive up to its edges. The touch-surface doesn't have a vertical or horizontal scroll bar. It can't be added in the Elan Smart Pad software, either. The fixed scroll bar is no longer necessary due to gesture recognition, in the manufacturer's opinion. Users can scroll vertically and horizontally with two fingers. Additionally, you can remap numerous actions, like a swipe motion with two or three fingers, via the Smart Pad software (system control/mouse/devices). The keys click clattery and too loud. The pressure point is distinct but the feedback is awkward. 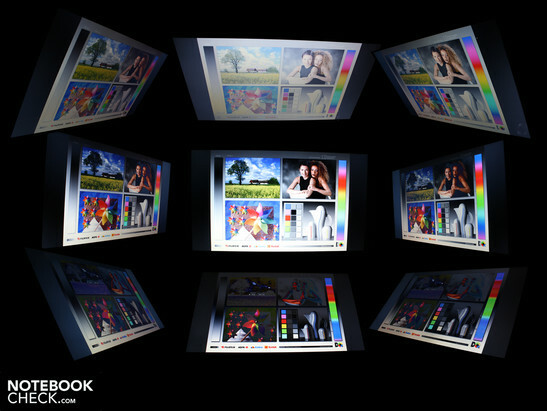 The 17.3 inch display has a resolution of 1600x900 pixels (HD+ display). The display's reflective characteristic can improve the low contrasts a bit. We've measured a mediocre contrast of 208:1 at a black value of 1.19 cd/m2. Good contrasts indicate brilliant colors and a deep black. A high-class multimedia laptop's display should at least have 500:1. The small color space proves that the N71JV isn't generous with the amount of representable colors (GAMUT). In return, the brightness assessment supplies good results. The luminosity is 236 cd/m2 on average. The illumination is fairly homogeneous, even if the LG Philips TFT reaches 250 cd/m2 on its brightest spot and 216 cd/m2 in its dimmest area. However, this difference isn't visible to the eye. The user needs a luminosity of 150 cd/m2 indoors at most. If necessary, the user can dim the brightness accordingly. This plus of luminosity might just be necessary for outdoor use, though. 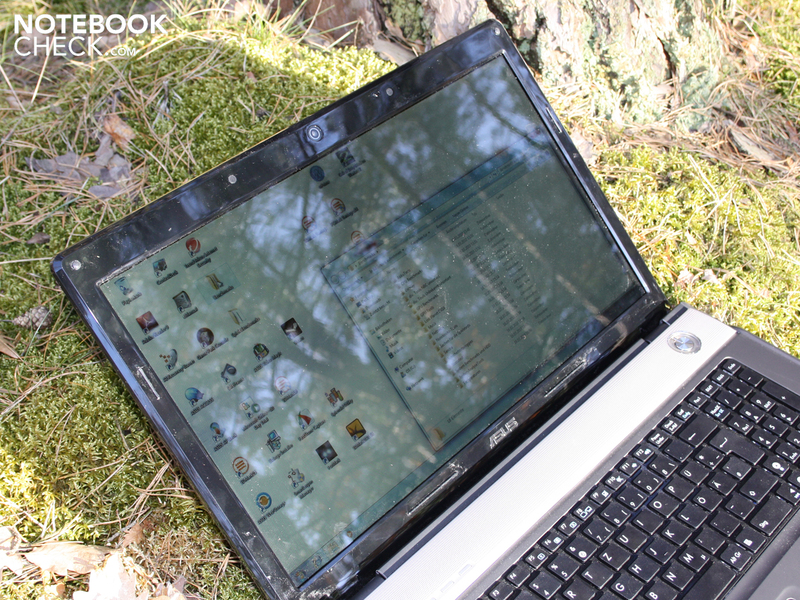 If you want to go outside with the laptop, you shouldn't insist on the Asus N71JV and prefer to take the matt Asus Eee PC 1005PE along. The 17.3 inch screen doesn't have an AR coating. 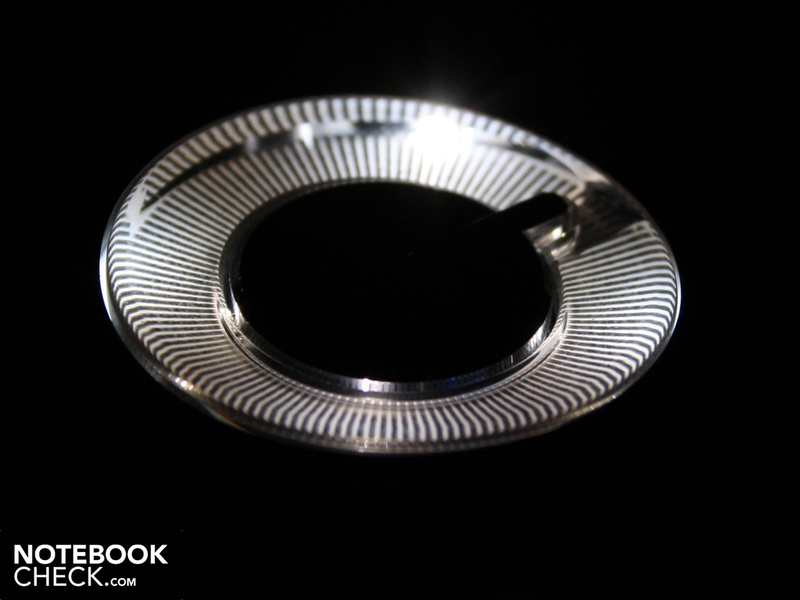 The high luminosity of 236 cd/m2 does its job against reflections quite well. 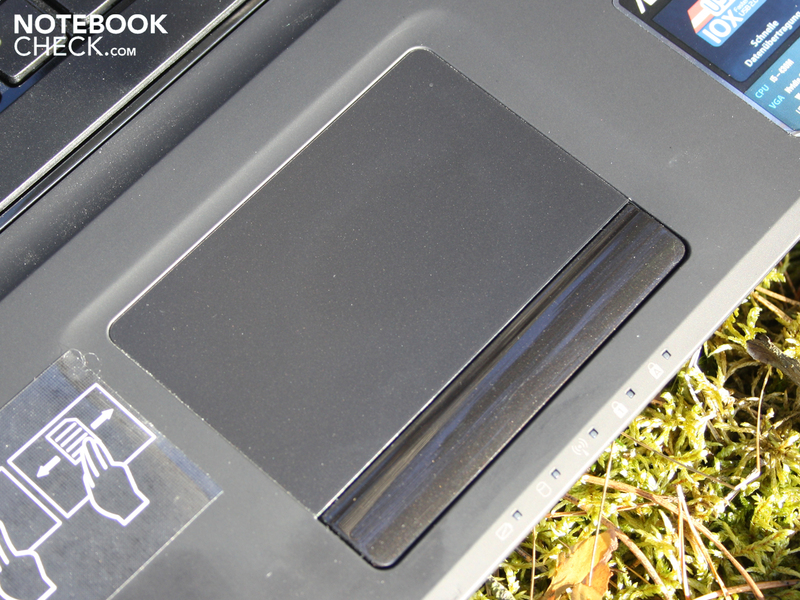 The user can recognize something even in sunlight with a bit of inconvenience. 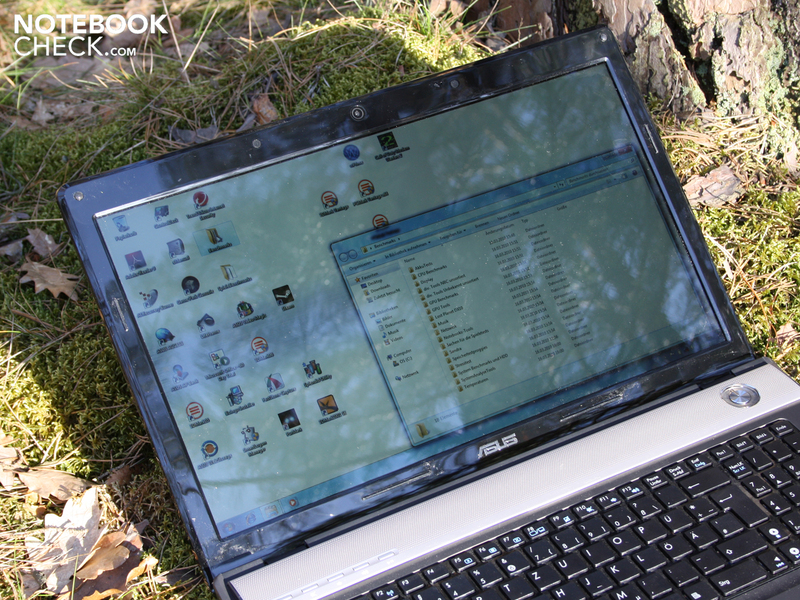 But we wouldn't really call this "working in the sun with the laptop", since the reflections limit the visibility too strongly. Corresponding to the dust and scratch sensitive high-gloss surfaces, and the high weight of 3.2 kilograms plus 360 gram adapter, mobile use is more frustration than recreation. 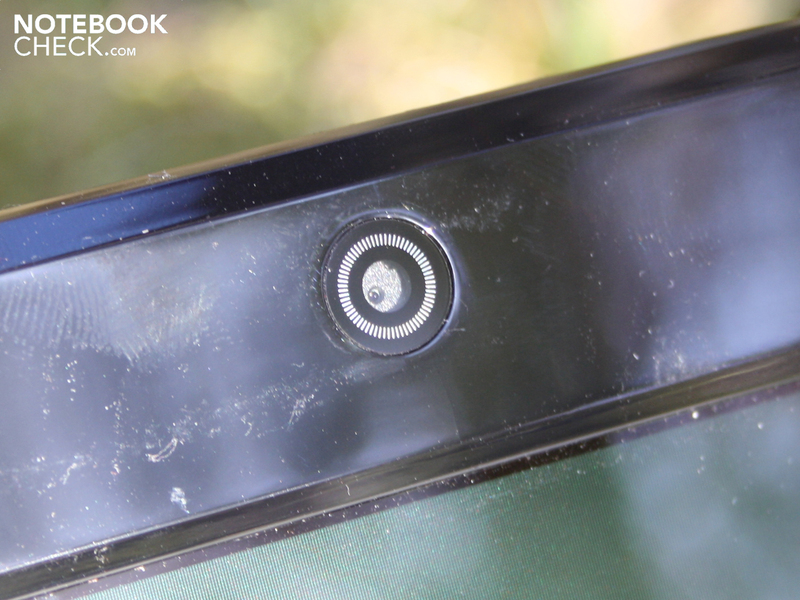 The vertical viewing angles are very narrow, the horizontal ones quite adequate. Our view could deviate up to 45 degrees before the display dims evidently and colors falsify on the horizontal plane. This effect already starts at a 20 degree deviation from the front viewing position on the vertical plane. The image dims obviously and colors invert. The narrow vertical viewing angles are very visible on the darkroom picture. Dark letters on a bright background tend to be less viewing angle dependent than colors and images. 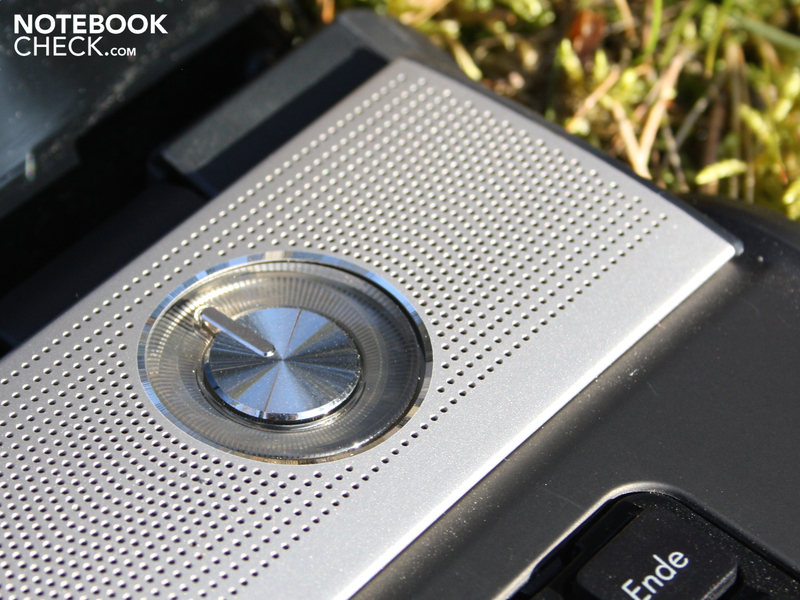 The low viewing angles of the Asus N71JV mean that DVD sessions with friends will prove to be difficult. The one or other will likely be unsatisfied with his viewing position, especially when the eyes are sitting further than two meters away from the screen. 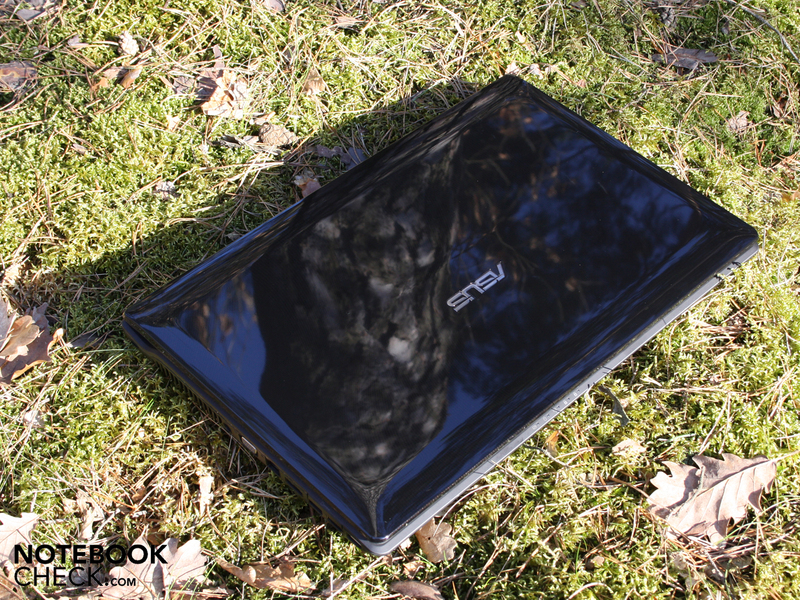 Asus has equipped its N71JV, version TY012V, with an Intel Core i5-430M. The 32nm CPU has two physical cores with 2.26 GHz each (standard clock rate). The real clock rate in turbo boost is between 2.25 and 2.533 GHz, though. The single processor cores are overclocked automatically by turbo boost. The applications determine how many cores are to increase their clock rate. Additionally, applications can access up to four cores (hyperthreading function). In this case not all four clock with 2.533 GHz but rather with 2.4 GHz. Only when one single core takes over the whole computing effort, will its clock rate be increased to the aforementioned 2.533 GHz via turbo boost. A highlight of the Core i5 CPU is the implementation of the memory controller and the IGP graphic card (GMA HD) into the processor's package. 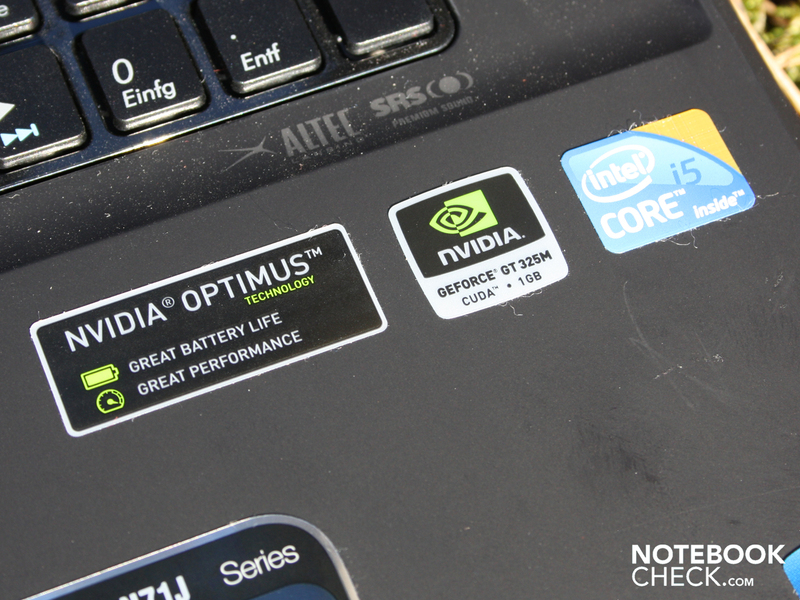 The GMA HD in the Asus N71JV comes into play with Nvidia's Optimus. This technology allows for the first time an automatic switching between an Intel GMA (in the chip set or CPU) and a dedicated Nvidia GPU. In this case, it's an Nvidia GeForce GT 325M, which represents a lower clocked GT 330M. Because the GMA HD's frame buffer is used for the image output, there aren't any waiting times or a black screen during switching. Since everything is done automatically, the previously standard hardware button for the hybrid graphic is omitted. The benefit of Optimus is supposed to be a longer battery life. PCMark Vantage checks the interplay of CPU, graphics, RAM and hard disk. The total result of 5553 points clearly indicates a strong system. 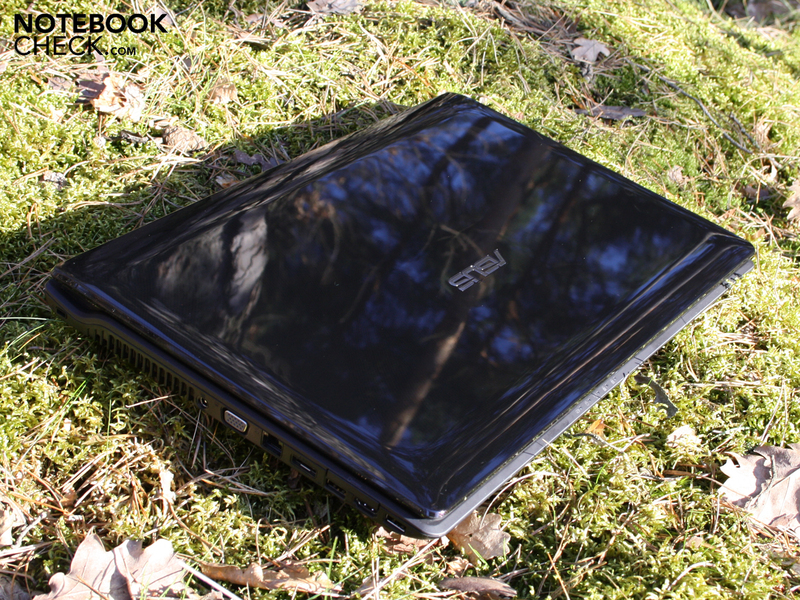 Merely laptops with a Core i7 720QM, 820QM or 920XM are more potent. A Core i5-520M only supplies a slightly higher performance. This is shown by merely 500 to 600 points in PCMark Vantage. For example, see the Samsung R580 Hawk. The 500 GB hard disk from Hitachi (HTS545050B9A300) is a participant of the PCMark Vantage rate. The 5333 point strong Geforce GT 325M only has a slight impact on the PCMark. A 5400 rpm hard disk from Hitachi supports the processor. The 500 GB HDD ((HTS545050B9A300) reads data with a rate of 60 MB/s from the disk in Sequential Read. 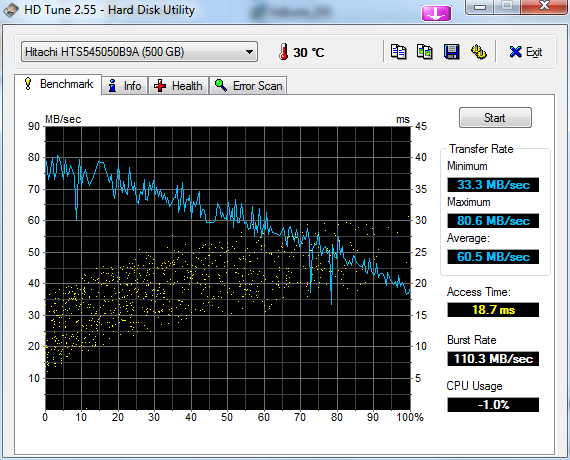 That is an average rate for current 2.5 inch notebook hard disks. The HDD is only audible by a consistent basic noise in use. The read and write heads don't click during work. An Nvidia GeForce GT 325M with a 1024 MB DDR3 memory is used as the dedicated graphic core. The GPU core has a clock rate of 450 MHz, the memory with 700 Mhz. The DirectX 10.1 GPU supports video decoding in the graphic chip (decoding of H.264, VC-1, MPEG-2) and unloads the processor with that. CUDA, DirectX Compute, OpenCL and PhysX characteristics typical for Nvidia are also onboard. They take over the computing work in certain multimedia applications. The 3DMark2006 is favored, but will it show us the true gaming power of the i5-430M + GT 325M combination at hand? Gaming fans will have their doubts. For this reason, we've executed a few gaming tests. The latest sequel of the Battlefield episode has recently been added to our gaming list. The Vaio EB1SE/B with a considerably stronger ATI HD 5650 has already experienced that Bad Company 2 doesn't exactly treat hardware with kid gloves (1366x768, high details, 4 x AF: 25 fps). The slower clocked GT 325M doesn't have a chance and is brought to its knees with the same settings: 17 fps. But if you don't want to give up Bad Company, you'll have to reset to, a still very pretty, medium details in the same resolution. Now it's an almost smooth 25 fps. However, the game proves how little power the GT 325M has for current games. The favored ATI HD 5650 with the same 430M processor can achieve a whole 37 fps in medium settings and medium details. It looks completely different in medium settings (1.024 x 768, medium, 2xAF) for Risen. The GT 325M can reach a good 35 fps. 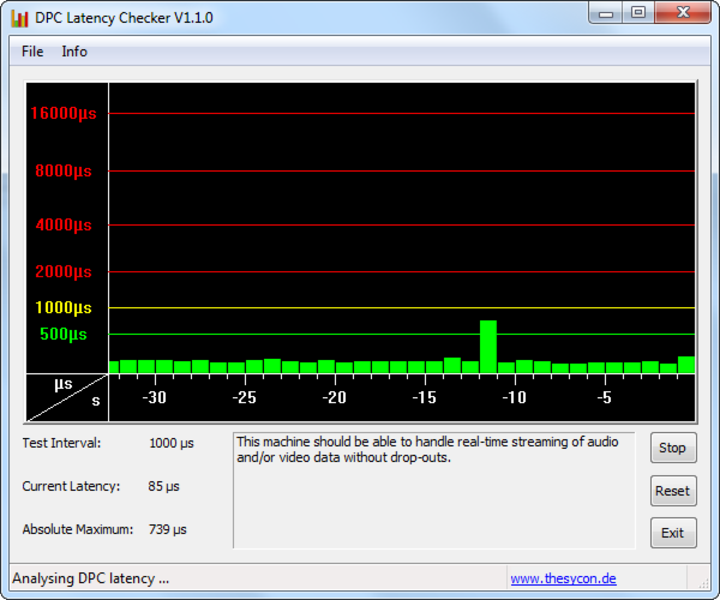 Thus, it's on the same level as a higher clocked Mobility HD 5650 in Packard Bell's Easynote TJ75-JO-070GE (i5-430M). Since the fantasy adventure is already very well playable with 25 fps, the user can switch to high settings. Risen is just still playable in the HD Ready resolution and high details on the N71JV: 25 fps. The Asus N71JV can benefit from the i5 processor's hyperthreading. The multi-core game from the end of 2007 can also be played in high details with 25 fps. This applies to a low resolution of 1024x768 pixel in keeping with our benchmark definition. You shouldn't consider the native 1600x900 pixels. The N71JV's GPU is again inferior to a HD 5650 or even a GeForce GT 330M. The comparison GPUs have 33 and 28 fps respectively in the same settings. The popular shooter is already an old hat and therefore treats current hardware more ergonomic. The game runs with 70 fps in 1024x768 (XGA) and high detail settings. This leaves a lot of room upwards and 1366x768 pixels are therefore just as playable in high details. The game benefits from the processor's turbo boost, as the Acer 7738G (Q9000, GeForce GT 240M with a faster GPU is easily outdistanced (7738G: 57 fps). The shooter doesn't run smoothly in 1024x768 pixels and high details with a weak 20 fps, any more. Using DirectX 9 and medium details is naturally possible, but high resolutions aren't feasible with that, either. Gamers can go up to a maximum of 1366x768 pixels. The difference to the HD 5650 is striking here: The ATI GPU achieves a whole 24 fps more (44 fps) with the same processor. The Nvidia sister model, GT 330M, shows itself not quite as weak and supplies a well playable 35 fps in the same settings (Samsung NP-R580-JS03DE). Geforce GT 325M – Gamers should leave it in the shelf. 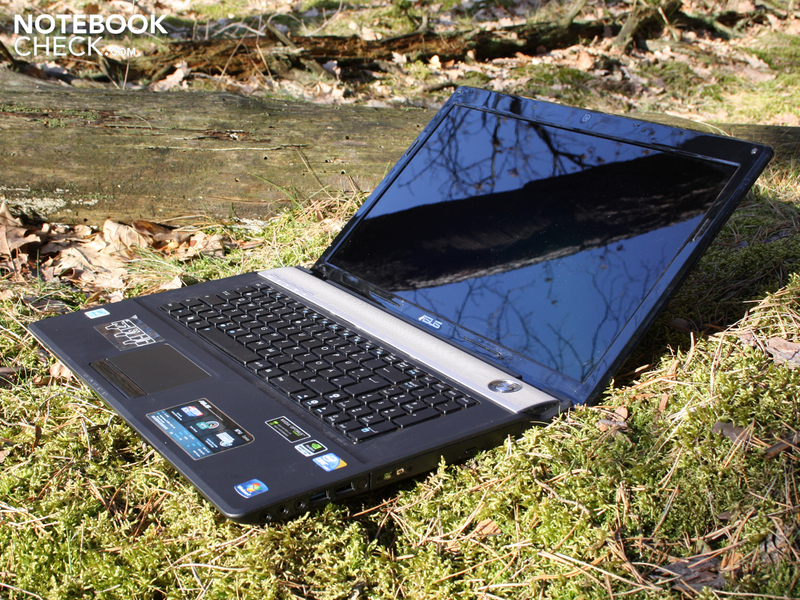 If you're really seriously thinking about playing games regularly on the notebook, you should at least buy an ATI HD 5650 or an Nvidia GT 330M in case of a tight budget. 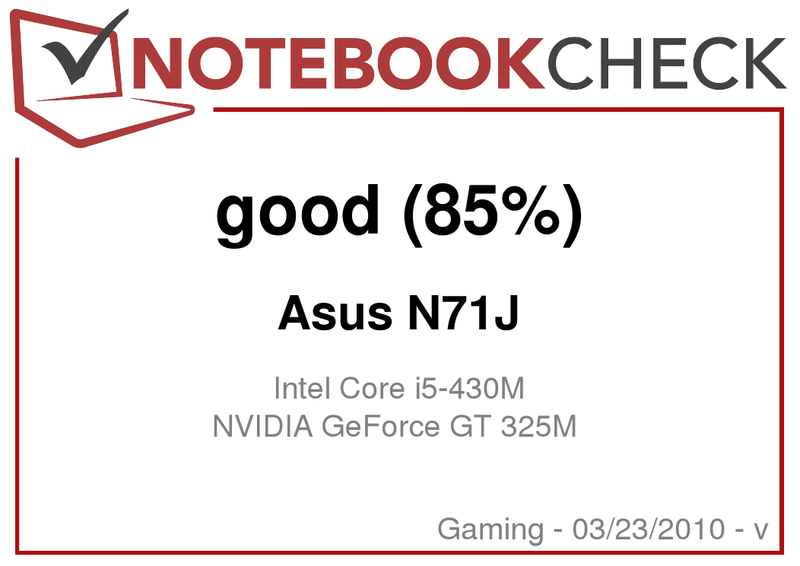 Gamers have to live with strong losses in details and resolution due to the GT 325M in the Asus N71JV - too strong for a balanced gaming experience. Asus heralds the N71JV as a musical entertainer (performance & acoustics). When listening to your favorite music and convert videos for the iPhone, you won't be annoyed by a irritating or loudly whirring fan. 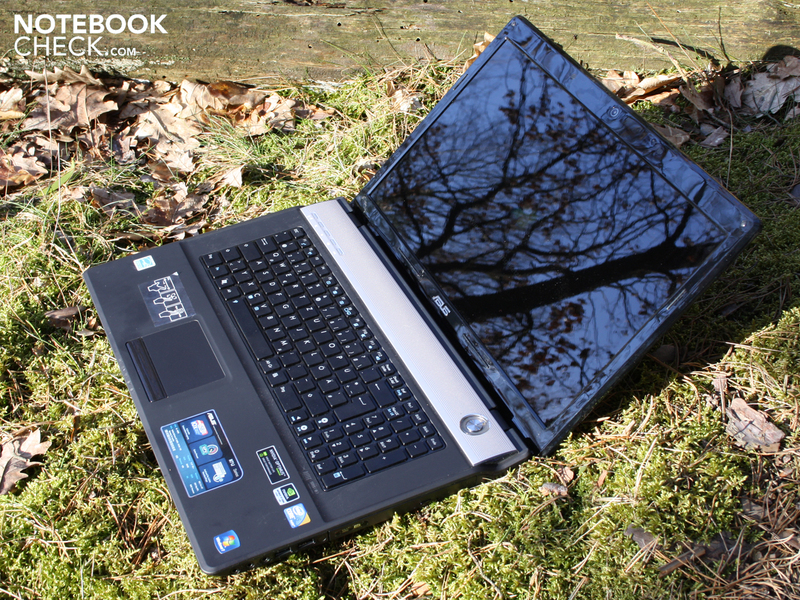 In this matter, the manufacturer has solved the waste heat problem of a high-performance laptop perfectly. The system noise level doesn't exceed 31.9 dB(A) when put under load by a computer game. Most notebooks with a dedicated graphic card already emit this noise level in idle mode. We couldn't force the N71JV over the 34 dB(A) mark even in a stress test, where the processor and graphic card are both fully loaded. The fan blows hot air very noticeably out of the case, but stays pleasantly consistent and quiet. Consequentially, the high cooling performance would allow users to surf or write in Word without any fan activity at all. The fan is never completely disabled (not even in Silent Office Mode), but it runs extremely quiet with 31.1 dB(A). 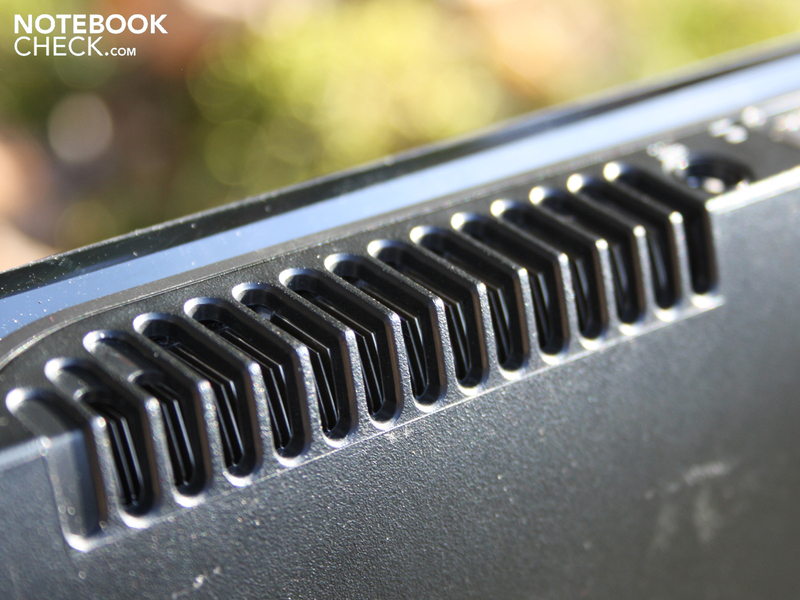 Now, if you fear that the Asus N71JV will get unreasonably warm due to the quiet fan, you can relax. The average temperature on the bottom was 25 degrees Celsius during a scenario of surfing and word processing, so almost idle. The wrist-rest area stayed pleasantly cool with 24.5 degrees. The N71JV even survived the 12 hour stress test without taking damage. The GPU never got hotter than 71 degrees Celsius. We've recorded the waste heat under load in high performance mode. 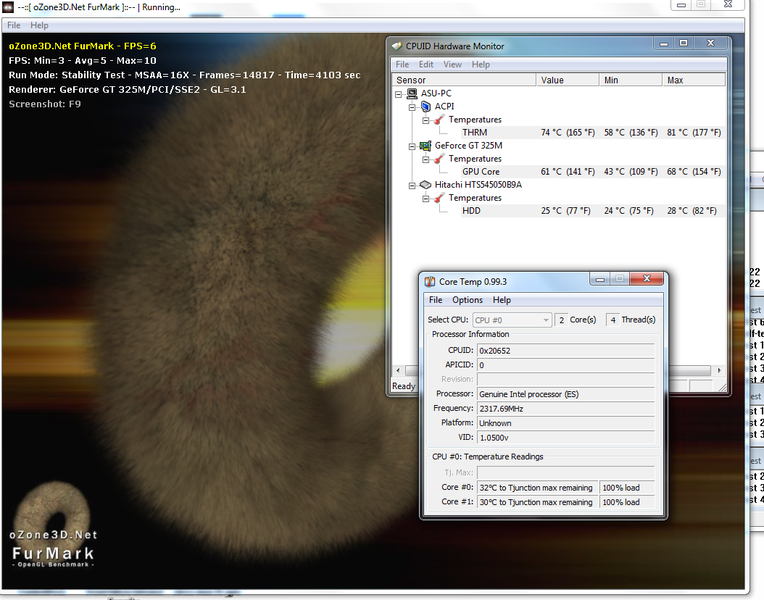 The evaluation under highest CPU/GPU load determined a maximum of 38.8 degrees on the upper side. That is very high, but we measure this temperature directly from the louver. The wrist-rest doesn't get much warmer than 30 degrees Celsius now, either. We only felt a bit of heat on the bottom, in the height of the fan and heatpipe. Whilst we measure a very warm 41 degrees there, the area under the wrist-rest remains astonishingly cool with 23 to 25 degrees. The 12 hour stress test didn't have an impact on the components' performance. 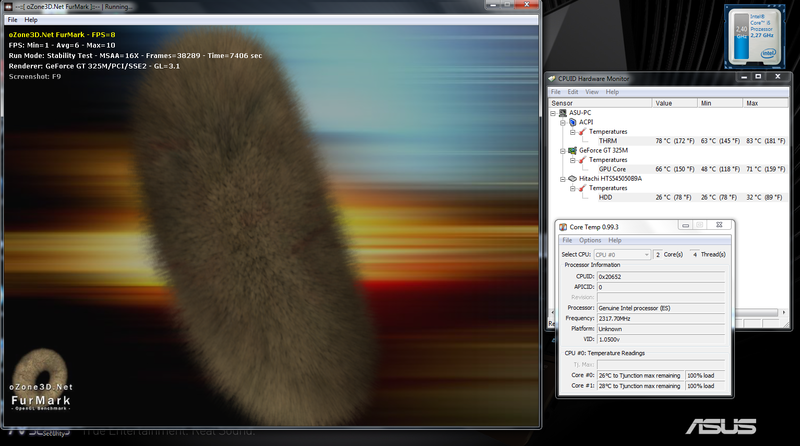 A 3DMark2006, executed immediately afterwards, reached almost the same 3DMarks as in the normal test: 5330 3DMarks /1280x1024). (±) The average temperature for the upper side under maximal load is 32.8 °C / 91 F, compared to the average of 32.9 °C / 91 F for the devices in the class Gaming. 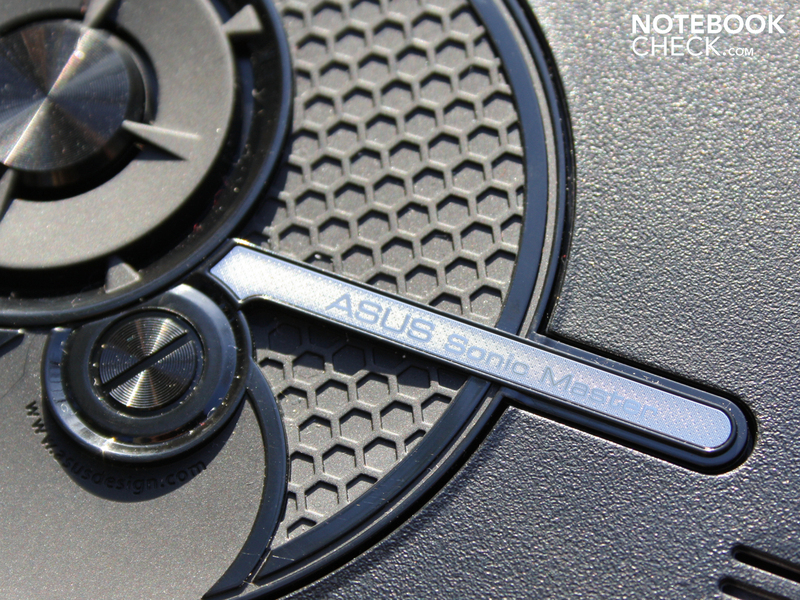 One of the most important characteristics of the Asus N71JV hides at the very end of our review: The SonicMaster. The manufacturer distinguishes Altec Lansing stereo loudspeakers with this sounding name, which are supplemented by a subwoofer on the bottom. This isn't anything special nowadays. 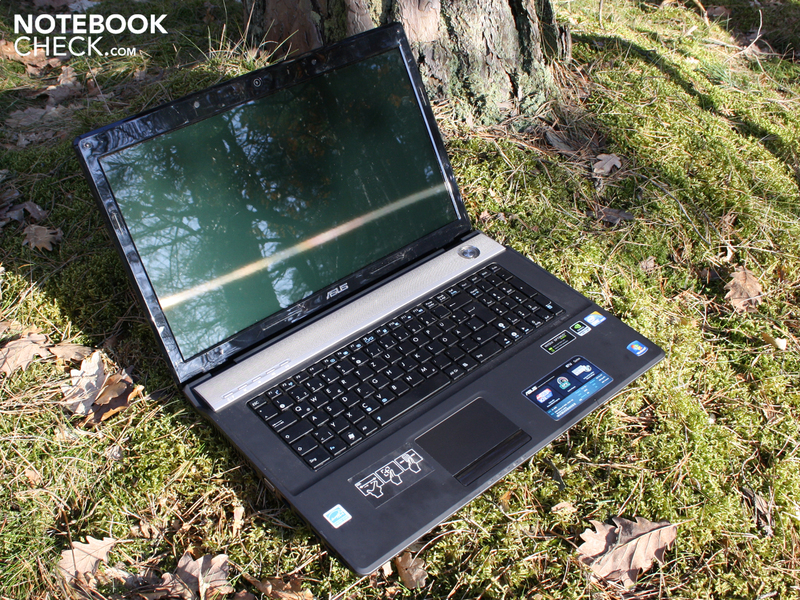 But the sound that we have experienced proves that Asus has successfully accomplished sound tuning. The sound is balanced in every volume. Trebles and midrange pitches are rendered perfectly by the Altec Lansing loudspeakers. Basses and deep pitches are carried out by the subwoofer on the bottom. It knows how to transmit the fitting vibrations to the wrist-rest. Thus, the hands can also experience music. Users can also have a lot of fun in computer games. Dialogue or gunshots are transferred directly to the wrist-rest's surface. The volume is adequate but not excessive for a 17 incher. Much more important: The membrane doesn't distort or scratch at all, even in maximum volume. Important: The SRS Premium sound enhancement has to be disabled. Otherwise the subwoofer is not activated. The normal sound enhancements (loudspeakers properties), such as the equalizer or volume balance can be used. According to Asus, the subwoofer is 3.5 watt woofer with a 38.8 milliliters volume. It's supplemented by Altec Lansing loudspeakers (2.1). The trebles and midranges are rendered equally well and undistorted. However, if you want to connect external speakers via the 3.5 mm sound-out, you'll experience noise-free music. We've tested that with two active Yamaha speakers (YST-M20SDP). 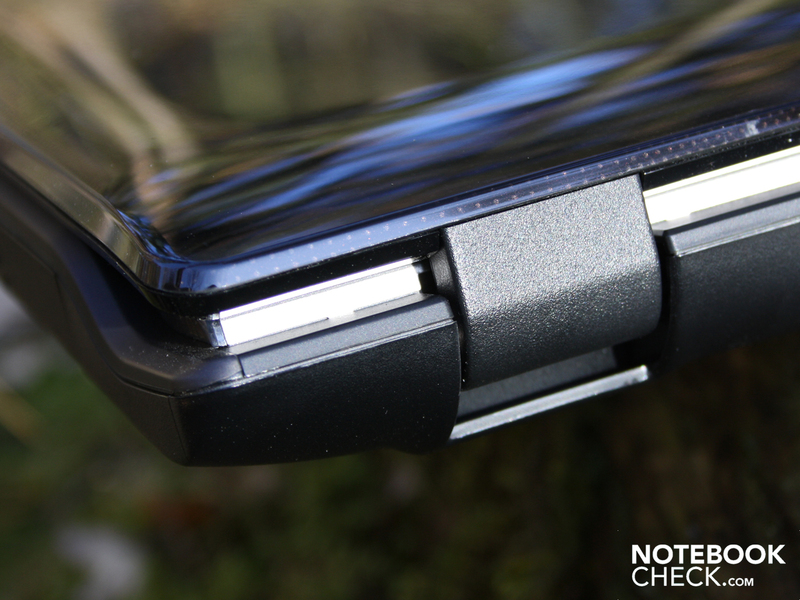 The notebooks's tethered volume can be lowered as desired. 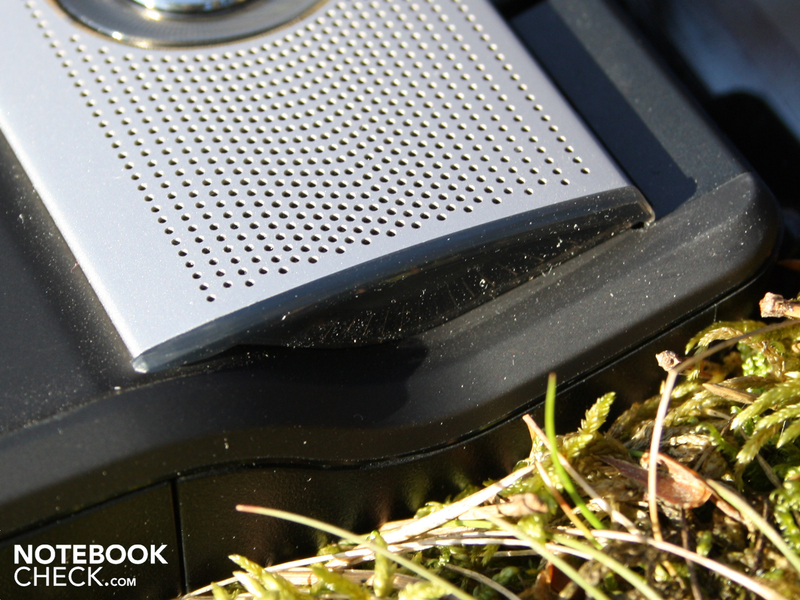 A hissing of the external loudspeakers doesn't turn up with the integrated sound card even in low output levels. Hi-Fi fans will opt for the optical S/PDIF port anyway, because the sound transmission quality in a sound system is superior. The N71JV's battery life is improved by the Nvidia Optimus technology. The automatic graphic switching (without user intervention) makes sure that the dedicated Nvidia GPU only computes when games or other software require it. The user can assign a certain graphic card fix to single programs if desired. This can be set in Nvidia's system control. 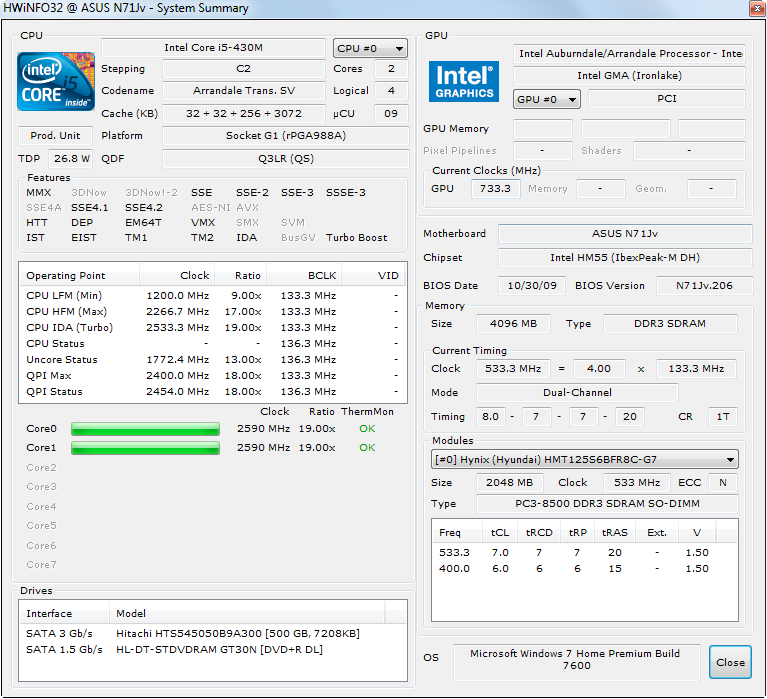 The GMA HD integrated into the processor is always active in the measurements. The N71JV reaches almost three hours (173 minutes) in a continuous internet surfing session with enabled WLAN. We visited flashing news portals and downloaded a few files in this time. If you're more frugal, you can very well achieve a bit over three and a half hours with maximum energy savings options. The maximum runtime is 228 minutes with the BatteryEater Reader's test. How long does a DVD movie run? Lord of the Rings first came to its end after 130 minutes. Those aren't any exorbitant runtimes that can keep up with ULV subnotebooks or netbooks. In view of the big size and the weak 4400 mAh battery, the runtime is remarkable. This becomes evident in comparison to other 17 inchers (dedicated graphics). Optimus doesn't contribute a lot for idle runtimes. The technology makes a difference of up to one hour in surfing and DVD rendering. The Samsung NP-R780-JS03DE (4.400mAh, 48 Wh, 520M, GT330M) only lasts for 132 (surfing) and 102 minutes (DVD). An Acer Aspire 7738G (4400mAh, 48.8 Wh, T6600, GT240M) even only lasts 103 (WLAN) and 81 minutes (DVD) remote from the mains. Or Dell's Studio 1747 (56 Wh, 720QM, HD4650). This 17 incher gave up after 108 (WLAN) and 90 minutes (DVD). 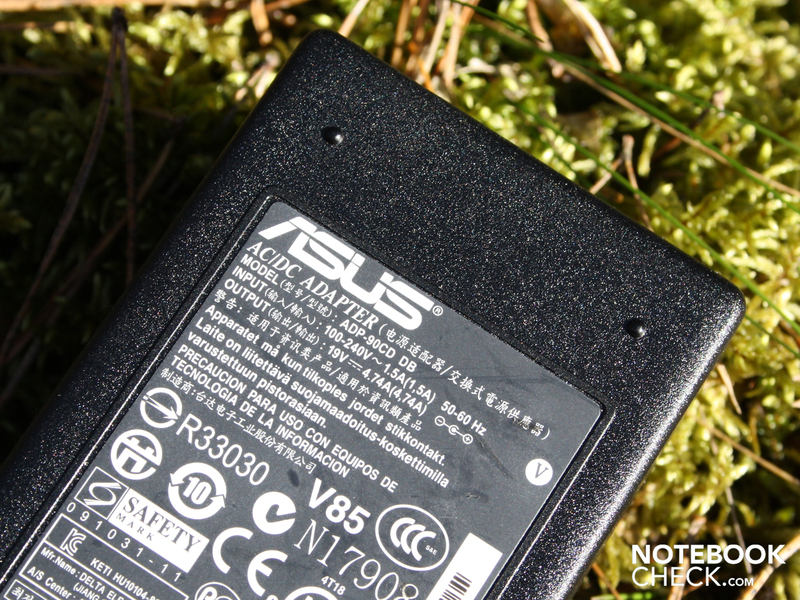 The Asus N71JV is frugal with power. If all energy savings options are exhausted, the idle power consumption is merely 12.1 watts. This is the load consumption of a 10 inch netbook. However, this can't be due to the Optimus low effective power, because even a Samsung NP-R780-JS03DE (17 inch) with a stronger i5-520M processor and dedicated GT 330M only needs 14.3 watts. Nevertheless, the user will always be a bit more economical with the N71JV than with the current 17 inch competitors with Core i5 CPUs. The aforementioned Samsung R780 treats itself to 21.6 watts for a maximum idle consumption (high-performance, all enabled, maximum brightness). 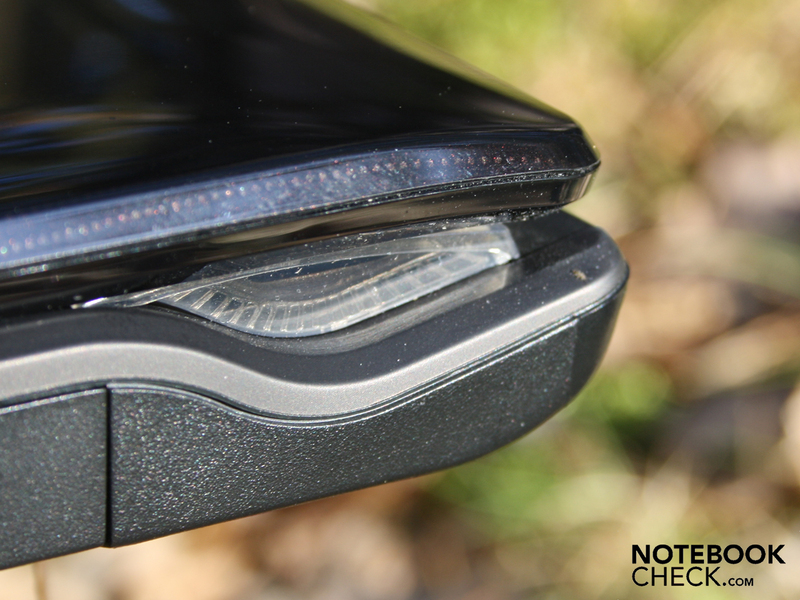 The N71VJ manages with 19.3 watts and even has a brighter display. Seen realistically, potential buyers should presume an average of 25 to 30 watts. 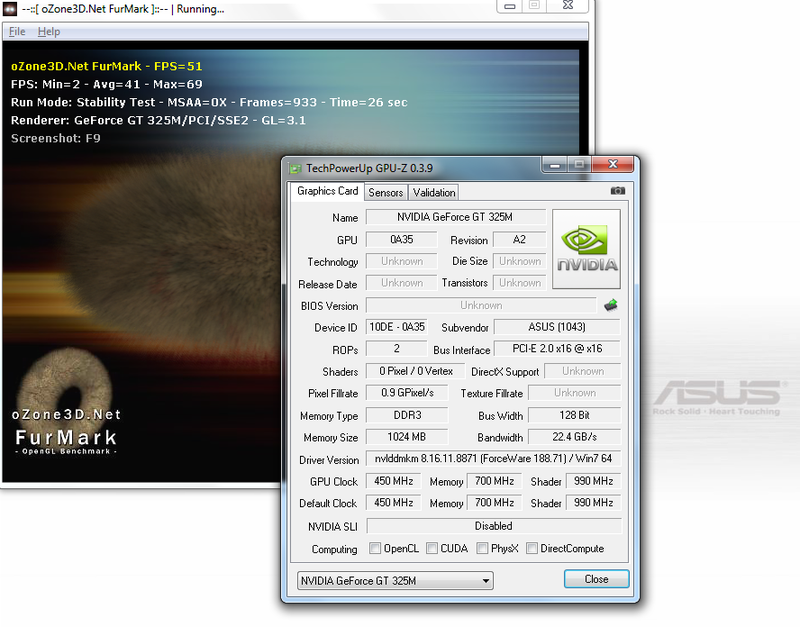 If the Nvidia GPU is active during a computer game, the effective power increases to 51.1 watts. We determine the maximum requirement in a stress test with Prime95 and Furmark. Our multimeter displays 79 watts. The 90 watt adapter is therefore adequately sized. Asus has assembled an entertainment-suitable 17 incher with its N71JV. 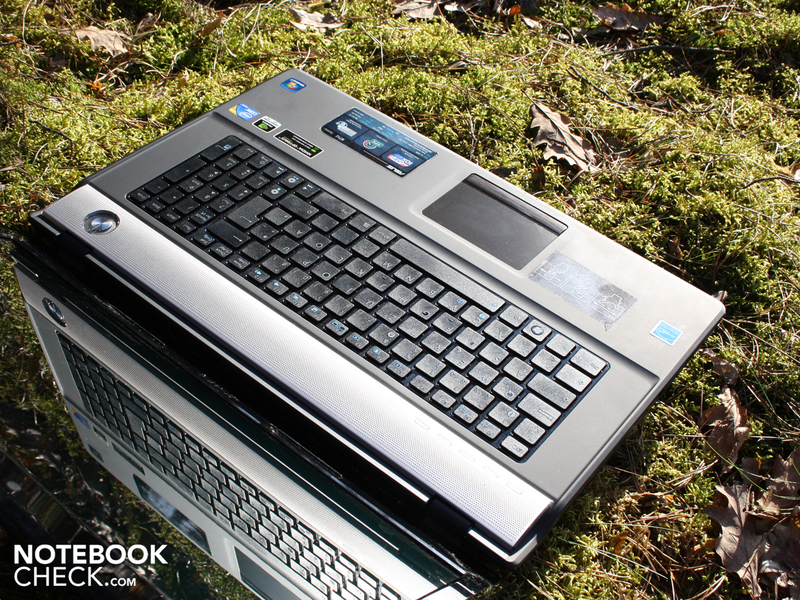 The laptop is weak in the field of current games, but can score even more in sound emissions, ergonomics and battery life. The subwoofer, called SonicMaster, let the hands vibrate pleasantly during music rendering or games. The wrist-rest always stays cool and the fan is almost silent. The battery life of three hours in WLAN surfing or two hours in DVD watching are impressive in the 17 inch multimedia class. 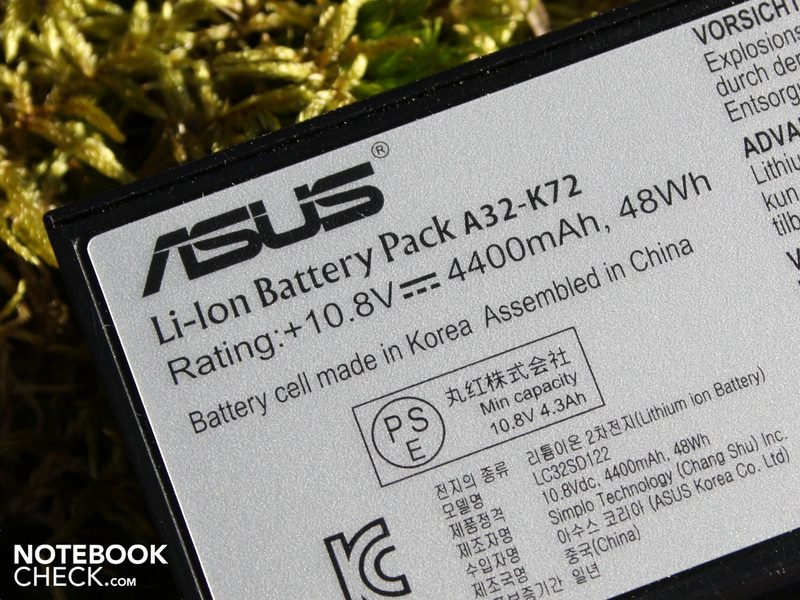 There are barely any similarly sized notebooks that accomplish a better mobility with a weak battery (4400 mAh). 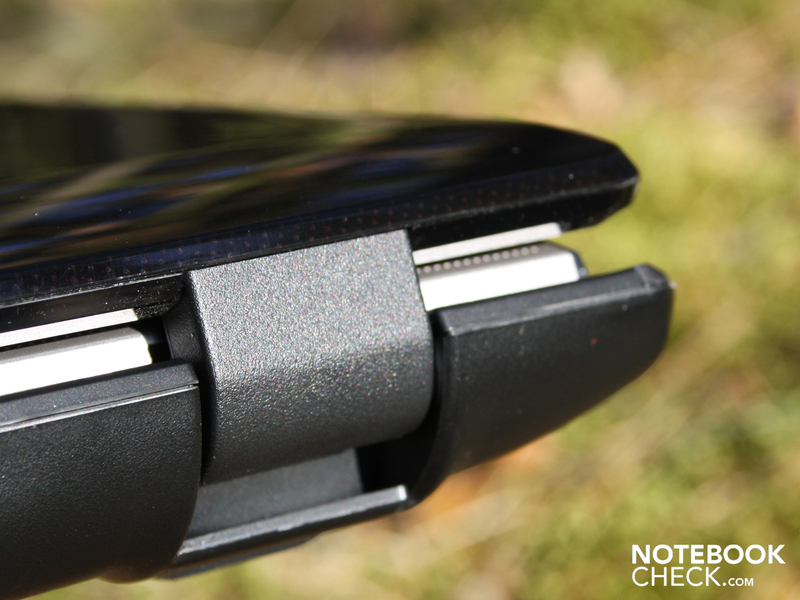 The N71JV also has sufficiently stable, pleasant surfaces on the work area and a bright display on the pro side. Weaknesses become evident in office use. The keyboard's feedback needs getting used to and the keys (especially the number pad) are inordinately tiny. The glare TFT only has narrow viewing angles and the contrasts are low. There aren't any official prices yet, but the Asus N71JV will likely be within the range of its predecessor, so 800-900 euro. The Asus N71JV isn't yet another boring 17.3 incher with a Core i5 processor. The hinges sit tight in their anchoring, but tend to teeter. if it wasn't for the glare type TFT. The reflections are annoying. but lasts for almost three hours in WLAN use, though. A very good battery runtime for a high-performance notebook of this size. The adapter will be a permanent companion, anyway. 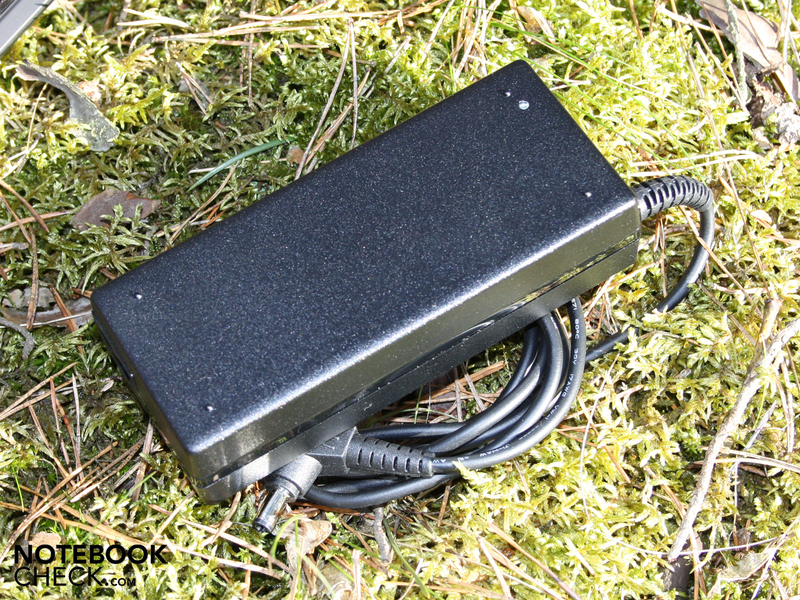 It has a capacity of 90 watts and therefore adequately sized. The bottom has two maintenance covers. and the RAM modules (4096 MB) here. A 2.0 megapixel shouldn't be left out. 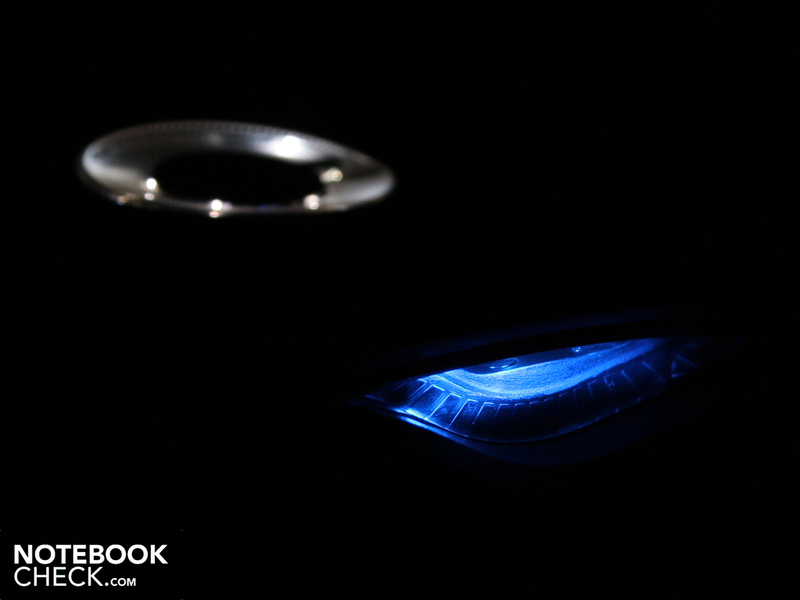 These LEDs light up blue (see picture above) when the notebook is turned on. It wants to be a sound master. The bottom surprises with a futuristic subwoofer. 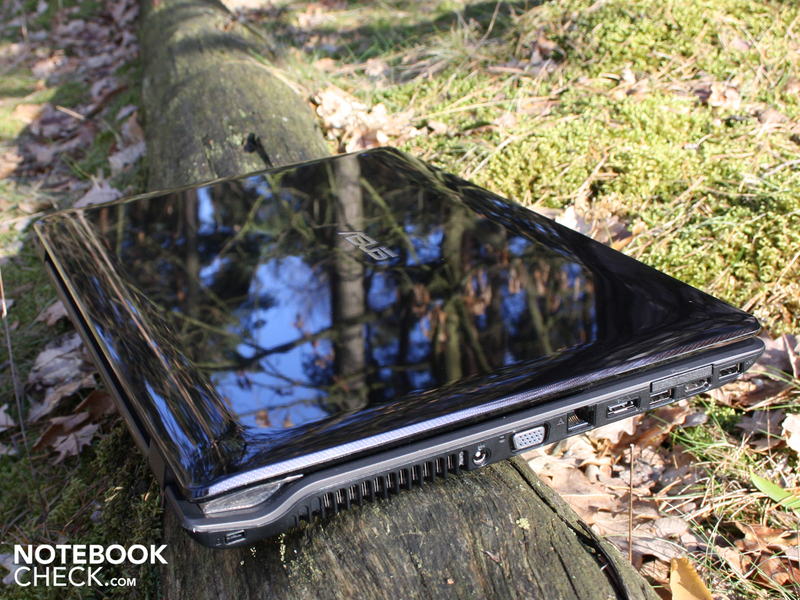 It allows the strong multimedia notebook to take off in sound matters. But the high weight of 3.2 kilograms brings it back to earth. while the case is basically built solidly. Merely the lid's surface yields slightly due to its size. Nvidia's automatic GPU switch, Optimus, is onboard. 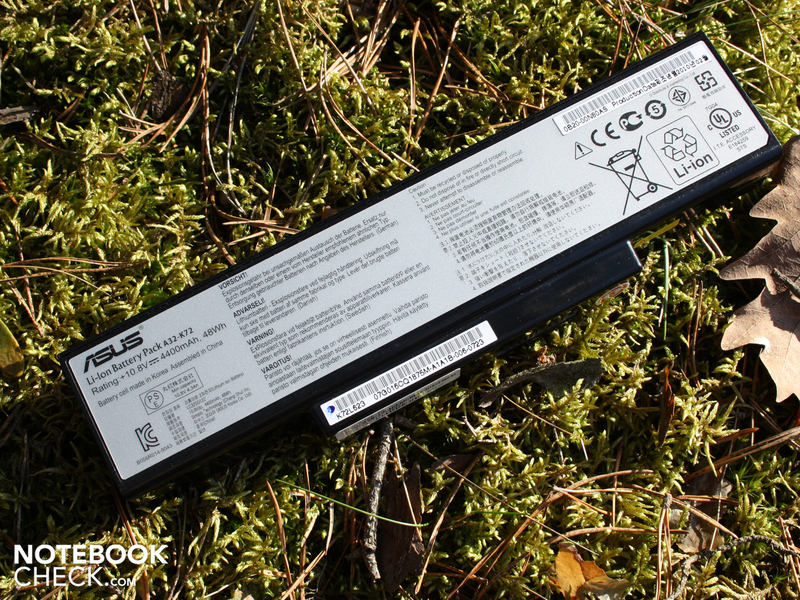 Asus wants to supply its 17.3 incher with a good battery life with it. somehow look like stereo systems (power button). These details also bid attractive effects in the dark. The power button lights up in white and looks like a juke box. 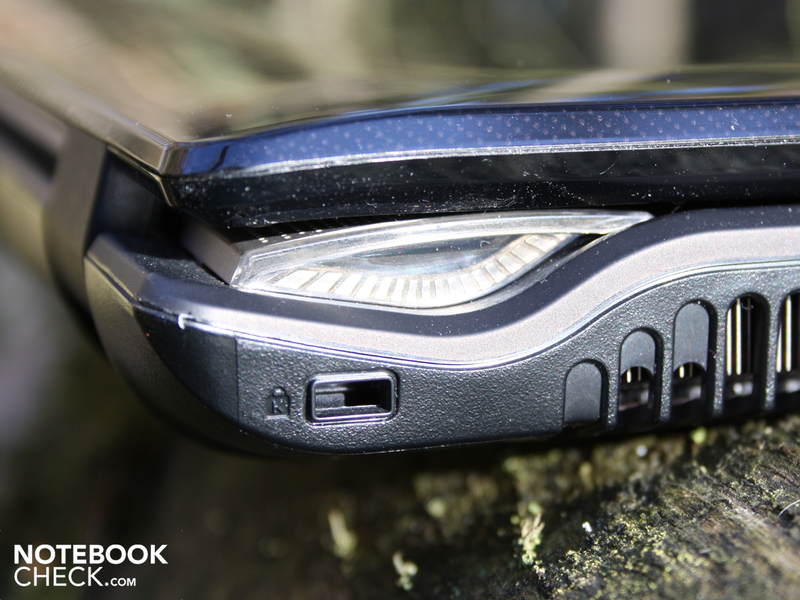 ASUS N71JV: The subwoofer makes the wrist-rest vibrate. We can still accept the mediocre display. But the tiny keys, despite the huge space - that could have been avoided. Why a second, empty HDD slot exists, but SATA connection doesn't. 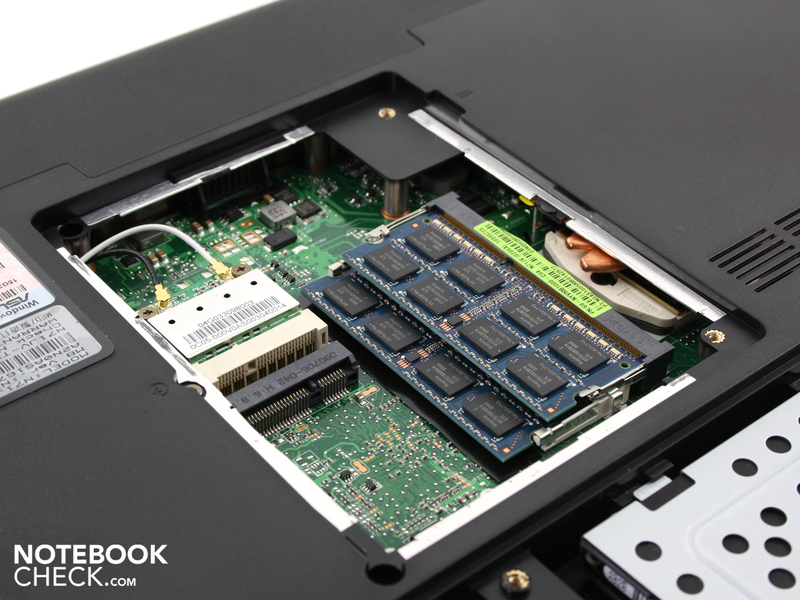 Sony's Vaio VPC-F11Z1/E - without a subwoofer, more expensive but more performance. Samsung's NP-R780 - cheaper and with more gaming power, but without a subwoofer. Dell's Studio 1747 - more performance, similar TFT, but considerably more waste heat and noise.